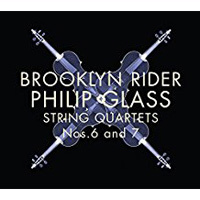 PHILIP GLASS (b.1937): String Quartets No. 6 and No. 7, Saxophone Quartet (arr. violin, 2 violas and cello). Description: The Saxophone Quartet dates from the 1990s and previously existed in an orchestrated version as well as the original. This transcription for quartet with two violas works very well, requiring very little adaptation of the text. The first and third movements are very typical of Glass' style of the 1980s and 90s, but the second and fourth with their syncopations and jazzy energy, and in the finale an almost folk-rock feel, are less so, bringing in some scalar patterns reminiscent of 'Einstein' and some unusual harmonies for Glass. The quartet, in the hands of composers who repeatedly return to the genre, has long been an index of the evolution of a personal musical style, and so it is with Glass. The Sixth, though clearly post-minimalist and with frequent references to previous stages in Glass' development, allows a far greater degree of dissonance (sometimes quite startling), more rapid and unpredictable chord changes and a more varied textural palette than its predecessors. In these respects it is akin to the more recent symphonies and piano music (a progression also to be heard on 01Q055). The single-span Seventh is a paradox. Much of its thematic material is a throwback to earlier styles, but the richer quartet textures and a sense of development - not a term that usually springs to mind in relation to Glass - gives the impression of a more conventionally conceived, less 'minimalist' quartet than the composer's previous essays. The work was commissioned for dance, and it may be the necessity of carrying a sort of narrative that relates it more closely to Glass' recent stage works than his earlier instrumental compositions. Brooklyn Rider.